A recent study has shown that our ability to sit down on the floor and then get back up may be an indicator of how long we’re going to live. Middle-aged and elderly people who need to use both hands and knees to get up and down are almost seven times more likely to die within six years, compared to those who can spring up and down without support. While the ratio of muscle power to body weight is the most important factor in such ability, there are other very relevant aspects to it. Aside from strength-it is mobility, balance, and coordination-that also participate very significantly in the transition from standing to sitting. At MovNat, fitness is the practical ability to physically perform in the real-world. 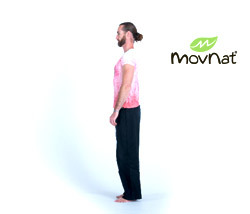 So, when was the last time you sat on the floor, and how easily did you move from standing to sitting and back to standing? Do you remember how well you performed, how you felt? Do you remember having to use your hands or not? Such a simple test gives a quick, yet objective window into your ability to function from day to day. If this movement is gives you trouble, it is a good sign that some more practice is in order. How many ways do you know to get up and down from the floor? How many of them can you do smoothly, with minimal effort? The Natural Movement book I am currently writing will cover over 20 different ways, including several that are done without hand support. Fitness is not limited to strength and cardio and some stretching. 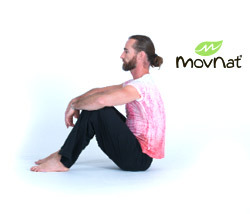 At MovNat, fitness is the practical ability to physically perform in the real-world. When you are older, you may not be able to lift as much or run as fast as you could when you are young, but you should seriously consider now that the simplest movement aptitudes will define your levels of physical autonomy in your later life. Will you be able to pick up your glasses after they fell on the living-room floor without being at risk of losing balance and hurt yourself? Now, are you ready for the squat get-up? As you will soon realize, it might be MUCH more difficult that it looks… something we often need to underline: what is simple is not always easy. Before you start, make sure that you are not wearing very smooth synthetic fabrics and/or try the movement on a very smooth floor, as it will make your feet and rear slide and give you lots of trouble. This one is easy. Just stand. Visualize the movement sequence you are about to perform. Lower yourself to the deep squat, slowly if you are not familiar with the movement. Ah… maybe this fundamental human position is out of reach. If you are physically active but yet can’t assume a stable, relaxed deep squat, you absolutely need to prioritize it, and to give more time and energy to other essential natural movements such as sits, kneeling etc… to recover the mobility you have lost over time. There is no magic quick-fix for solving squatting issues. Keep or bring your heels together and your feet splayed out. Gravity will pull you back and let you reach the bent sit effortlessly, lightly, and silently. If your bottom wasn’t close to the floor enough (photo 2) because of a lack of mobility, the transition might be heavy, loud, and not so comfortable. Avoid trying if your squat position is not deep enough. If you insist, then at least place a pillow where you intend to sit! Rest a few seconds in the bent sit. Pull your feet close to your bottom, heels against each other and firmly planted on the floor, feet splayed out, as the position of your feet is crucial to being successful at transitioning to the squat. Extended arms forward. Quickly lean forward (you’ll need abdominal strength) to generate momentum, but also to shift weight to the front, helping your center of gravity to get position over your feet as fast as possible, preventing gravity from pulling you back. Imagine you are using your heels as handles, and actually pull from your feet into the deep squat. You must feel the traction in your feet. You are back in the deep squat, ready to stand back up, right!? No?!? OK – I’ll give you three ways to make this a little easier at first*. – If you’re outside, find a slightly inclined area, and start the movement facing downhill. – Use something you can hold on to (a fence, a small tree etc..) to assist your squat and the transition from the squat to the bent sit. – From the sit, lay back and swiftly rock forward to generate some helpful momentum. – Find a partner, and cross the index of one or two hands. One of the partners will help you control, and perform the movement on the way down and up. Switch roles. The irony of this movement is that it should be considered one of the simplest, most basic human movements, yet most people, including some of the strongest and fittest, will have trouble doing it. The truth is that it should EASILY be done by every healthy human being. Very young kids can do it. I saw my wife Jessika regularly do it while pregnant, even just days before giving birth. She still does it, down and back up while holding our one month son, like it is nothing. She’s never trained for it, but she has also never stopped squatting and moving naturally her whole life (she’s 33). So lets not blame our stregnth or conditioning, but rather our natural-movement-poor lifestyles. Most importantly, let’s seriously reconsider the value of practical, fundamental movements in our daily lives. Simple isn’t easy, but it is always worth doing. All photos from Erwan’s upcoming book, The Practice of Natural Movement. I never realized something so simple could mean so much. We take advantage of the small things. I use to let my children exercise with me I think after looking at this I will start exercising with them. I have terrible problem getting up from squatting. My knees lock up. I have RA and Fibromyalgia along with a long list of illnesses.